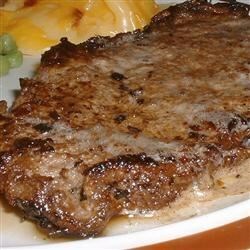 "This recipe of strip steak pounded thin, seasoned with dry mustard, and pan fried, goes great with cooked mushrooms. Just add them to the pan during the last few minutes of cooking time." Pound steaks to be 1/4 inch thick, and sprinkle each side with salt, black pepper, and 1/8 teaspoon mustard; rub into the meat. Melt margarine in a large skillet over medium-high heat. Fry 2 of the steaks for 2 minutes on each side, and transfer to a hot serving plate. Repeat with remaining 2 steaks. Add lemon juice, chives, Worcestershire sauce, and remaining mustard to the pan, and bring to a boil. Return the steaks to the pan to heat through, and coat with sauce. Very easy to prepare and people liked it a lot. I found that I needed more mustard than what the recipe called for. Also, I totally recommend serving with mushrooms. My ex's mother used to make this same recipe with the addition of red wine in the sauce. It cuts the acidity of the lemon juice and compliments the steak nicely. Good. I added a little dijon at the end.